Me: People made these buildings without construction trucks or equipment – can you believe that? How do you think they made these buildings? C: *looks at the nearby temple* With rocks. Well, I guess you’re right! Even though she was dealing with a cold and some itchy mosquito bites from the day before, she was a trooper in the heat. The other great thing about the ruins at Uxmal is the beautiful views. Just look at that blue sky and the white clouds. That isn’t a picture from online – I took it myself on an iPhone. This archaeological site is cared for and maintained nicely. 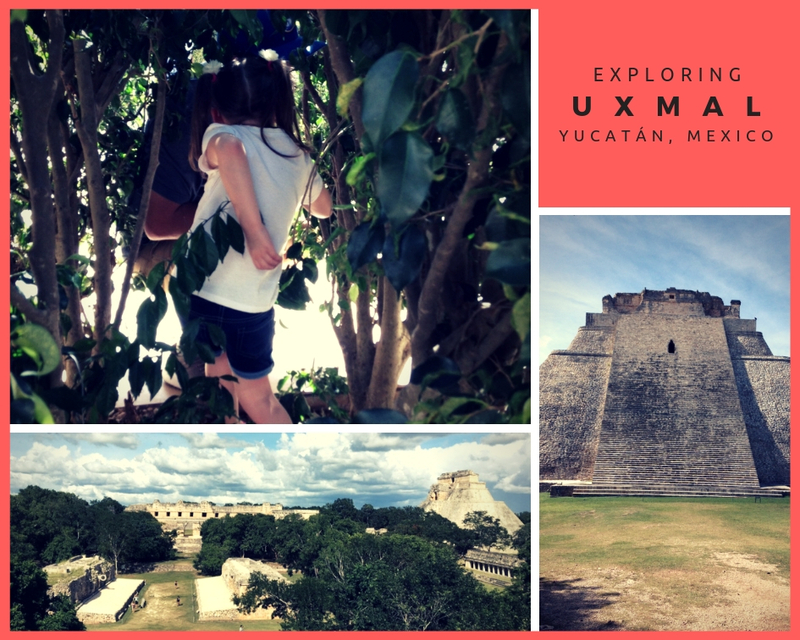 I know Chichén Itzá is more famous, but I would personally recommend Uxmal. While we only stayed as long as a four-year-old can handle at a place like this, it was definitely worth the sweat! Since we had about an hour drive to the ruins and back, I managed to squeeze in a bit of reading. My current read is Strange the Dreamer by Laini Taylor. It’s a Young Adult Fantasy novel, and while I was annoyed by some of the flowery language and (too) fancy word choices at the beginning, I’m appreciating it more now. The book is magical and I can’t wait to see what happens next. Last year during NaBloPoMo, I posted about feeling a bit lost when it came to the graphic novel genre. I’m intrigued by graphic novels. I want to like them. But I hadn’t really found a graphic novel that felt like it fit me. I finally found several graphic novels that impressed me, so much so, in fact, that I now own a box set! And I would like to own a copy of the other great book, too. John Lewis – yes, the congressman from Georgia – shares his story of how he became a key figure in the civil rights movement. Book One covers John Lewis’s early life and how he became involved in the movement, including his meeting with Martin Luther King, Jr. The novel shows how the student movement began as they carried out nonviolent lunch counter sit-ins. While Lewis reflects back on how the movement began and changes he helped bring about, he’s also preparing for the inauguration of history-making President Barack Obama. Book Two is a bit darker, following Lewis as he and the Freedom Riders board a bus headed to the deep south. The riders are faced with violence, imprisonment, and arson. Book Three covers the Birmingham Church Bombing and how activists attempting a nonviolent march across a bridge in Selma were beaten by state state troopers. March is a powerful series that should be read by everyone. The Civil Rights Movement often gets boiled down to the basics in school, but I learned so much about other important leaders and organizations during the 1960s, what went into the planning of the March on Washington, and how dangerous it was for people to protest – even peacefully – and especially in the south. John Lewis is incredible and, as he points out near the end of the book, is the only one left of the “Big Six.” At only 23 years old, Lewis participated in sit-ins and peaceful protests, was a freedom rider, witnessed police brutality, endured jail time, met with President Kennedy to discuss the Civil Rights Bill, and spoke at the March on Washington before Martin Luther King, Jr. gave his “I Have a Dream” speech. We could all use a refresher on our recent past, and this book provides that information in a very accessible way. The comic book format makes it more dynamic and emotional than a history book. Great storytelling and great illustrations. I read March: Book One on my kindle fire and really liked how I could double-tap on a picture and the frame would enlarge on the screen. Then, by swiping, it would switch to the next frame in a really cool way. By double-tapping again, it would zoom out so I could see what the entire page looked like. I sometimes find reading graphic novels a bit confusing, so this feature was really great. The next book, I checked out from our library, and by the time I got to the third book, my husband bought me the three-book series because I talked about how well-done this series was. I’m glad that I own these. They are worth rereading. Five stars and beyond! Melinda is just starting her freshman year of high school and she’s already an outcast. That’s because she called the cops on the big end-of-summer party – though no one is interested in her reasons for doing this. Struggling through a rough school year without her friends, parents who don’t pay attention, and teachers who are clueless, Melinda turns inward and mostly silent. Thanks to a passionate art teacher, time, and a need to protect others, Melinda finally reveals that she was raped by an upperclassman from her school. If you see this book in the library or at a bookstore, pick it up because you need to read it. Laurie Halse Anderson’s original novel Speak is the quintessential text on sexual assault for teens and young adults. It is a must-read because it’s so honest and real and poignant. Melinda’s voice – though she doesn’t say much – has so much to tell the reader. And in this version, what she doesn’t say is filled in by the expressive illustrations. This graphic novel, published almost 20 years after the original book, is a refreshing and relevant update, and just as important now as it was then. It’s not just important for teenage girls either – it is important for teen boys, college-age students, teachers, and parents. And even if you haven’t experienced sexual assault or harassment yourself, there is something for everyone to gain, whether it’s simply awareness or empathy. I don’t think you can walk away from this book without feeling something. Emily Carroll’s illustrations match perfectly with the text – it’s almost like they were always meant to be this way. I loved how the images stirred up feelings of sympathy, frustration, anger, and hope even though there’s not as much text to read as a full novel. Every few pages I found myself going “mmmm” – which meant, “Wow, Laurie and Emily, you just made an amazing point.” Even though I’ve read the original book multiple times and watched the movie, this still left an impression on me. Until women’s voices and victim’s voices are believed, until there’s no longer a need for #metoo and #timesup movements, until there is a belief that women’s rights are human rights, Speak will continue to be a necessary text. So read it. You won’t regret it. Have you read any graphic novels this year? Tell me about them! I know the last thing most people are thinking about on this holiday weekend is food, but if you’re getting sick of turkey and leftovers, this might just be the post you need today because I’m sharing something I’ve never shared on Love2Read365: a recipe! This is my absolute favorite meal from the year. And while I’ve enjoyed eating this one in every season, I think it will be particularly delicious as the temperatures get colder. I originally found this recipe on Paleo Grubs through Pinterest, but I kept it in my recipe book for at least a year before I ever tried it out because the length of the ingredient list scared me! But never fear – though the list is long, they are all easy to find ingredients. There’s nothing tricky here. I’ve changed the original recipe a bit by increasing the liquid to get more broth out of it, and upping the seasonings for more flavor. Without further ado, here is Slow Cooker Chicken Enchilada Soup. Add the chicken to the bottom of the slow cooker. I like to cut the chicken breasts into thirds – that way they get really flavorful and cook a little faster. I also like to use slow cooker liners because it makes clean-up so much easier. Add the onion, bell pepper, jalapeno, and garlic on top of the chicken. Pour the diced tomatoes and chicken stock over the top. Cover and cook on low heat for about 8 hours – or, cook on high for 3 to 4 hours. Serve it up in bowls and garnish with cilantro, avocado, and tortilla chips. This soup is seriously soooo yummy. I’d also recommend having a cherry Coke along with this filling meal. My husband and I eat this for two nights in a row, as this makes 4 big bowls of soup. Or – I love making this recipe when he’s away for business so I get to eat it all myself! Falling snow, flavorful soup, and a good book sounds like the perfect way to spend a cozy winter evening. This book may be marketed as a Rumpelstiltskin-retelling, but readers won’t recognize much of this story. This book is magical and original, but has glimpses of Narnia with a magical winter wonderland and influences from Eastern European fairy tales. A big take-away from this book is the art of making a deal. Be careful what you ask for, be careful of what you give in return, and be careful with your words. There are also plenty of quick-thinking, cunning girls – probably my most favorite kind of character. This is a fun, gossipy read. Imagine if The O.C. or Gossip Girl took place in the future in a super humongous skyscraper. All the drama, drugs, hookups, and secrets, but with advanced technology. A guilty pleasure of a novel. Back in the Grisha universe, Kaz Brekker leads a team of misfits with interesting abilities on the most incredible heist. While there’s a slow beginning and a lot of characters to learn about, the book picks up later and there is a driving sense of danger and urgency. You won’t want to put the book down.